Independent bookstores are not doomed. Here’s how they can fight back against Amazon. I didn’t make a lot of friends in the retail and publishing industries last week when I suggested that independent bookstores were the spawn of Satan. I argued that by making it cheap and easy for people to buy a lot of books, Amazon has been a boon for the book industry and “literary culture” in a way that many bookstores can’t match. Many defenders of bookstores countered that by focusing on dollars and cents, I’d missed the whole point of these establishments. Bookstores, it turns out, don’t primarily exist to sell books—instead, they’re more like bars for readers. “Bookstores provide a space to meet friends, cruise for a date, and hide out when you have nothing to do on a Saturday night,” Will Doig wrote at Salon. I suspect that many bookstore lovers agree with Doig, which is exactly why many of these shops are going out of business. Bars can survive because alcohol is an extremely profitable good. Books aren’t—so if you think of your favorite bookstore as a comfortable spot to find well-read potential mates rather than as a place for commerce, you’re not helping its owner. If you want bookstores to stick around, you should root for them to improve the way they sell stuff. Booksellers won’t survive the Amazon onslaught by merely wagging their fingers at the retail giant. Their only hope is to match the commercial innovations Jeff Bezos has brought to shopping. Indeed, this applies to all retailers, not just bookstores. The Internet has revolutionized how we buy stuff, but the main beneficiaries of this revolution have been warehouse companies like Amazon rather than firms that maintain a physical presence in your neighborhood. But it doesn’t have to be this way. This month, Amazon offered customers a discount to purchase stuff online while they were shopping at local establishments. It’s time neighborhood retailers fought Kindle Fire with Kindle Fire. Indeed, tablets and smartphones could be store owners’ best weapons against Jeff Bezos—if only they’d embrace them. 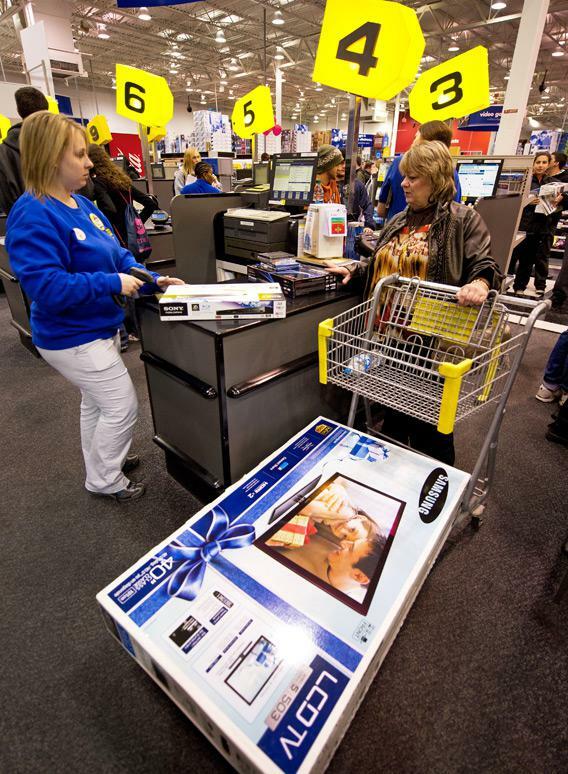 Of course, many stores are skittish about letting customers browse online. I often look up product reviews and prices when I’m shopping, and I’ve been busted several times by employees enforcing a strict no-barcode-scanning policy. I’m always offended by such policies—why shouldn’t I research the best gas grill before I purchase it?—but I can see the stores’ rationale. Prices online tend to be cheaper, so if I’m looking something up on my phone, there’s a good chance I’ll be attracted to the discount and walk out of the store empty-handed. Market research backs this up. One survey sponsored by Motorola found that in many retail categories—especially consumer electronics, sporting goods, and books—people use their phones primarily to compare prices; checking product reviews is usually a secondary use. But fighting the price checkers is a futile endeavor. People think of their phones as constant companions, so you’ll never convince them to keep them stuffed in their pockets. Plus, according to the same Motorola study, price isn’t always the primary reason that people decide to walk out without buying anything. Respondents said that the main reason they leave bookstores “without the item that you wanted” is that the store didn’t have the book they came looking for. That was true at toy stores, furniture shops, and drugstores, too. Other popular reasons for leaving a store without buying stuff? The customer couldn’t find the item, thought the lines were too long, or found the staff unable to answer questions. Smartphones could help stores address each of these problems. AisleBuyer, a startup based in Boston, has created a way for local stores to make their own smartphone apps. Among other features, these custom apps let customers make purchases from their phones—when you’re ready to buy that book, just press a button and walk out the door. AisleBuyer also collects and mines sales data from many of its clients, which means that over time, it will be able to build the sort of recommendations engine that powers Amazon. If your local record store uses an AisleBuyer app, then, it might suggest—based on your previous purchases—that you come in to get the new Adele album. Because the app tracks how often you’ve bought stuff, the store could even give you a discount for loyalty. Apple could also serve as a model for other retailers. Just before Thanksgiving, the company released an updated version of its retail app, which you can fire up when you enter an Apple Store. In addition to letting you buy products from your phone and pick up stuff you’ve purchased online, the app connects you to sales staff who can answer your questions. Say you go to an Apple Store to buy a laptop. You look at the various MacBooks, and you narrow your choice down to the 11- and 13-inch MacBook Air. Which should you buy? Just pull out your app and hit Get Help. This alerts an employee, who sees a map of the store on his iPod Touch; your location is highlighted on his map. So he walks over to make the sale. Anyone who’s ever tried to wrangle help in a busy electronics store—or a home improvement shop, a shoe store, a bookstore, anywhere—will recognize that this is a killer feature. Most indie bookstores don’t have the resources to fund their own app development. But tech consultants like AisleBuyer are making this sort of thing more affordable, and as customers get accustomed to shopping while clutching their phones, these apps will become just as important to local retailers as websites are now. If you own a store, I’d suggest you start thinking about building such an app. Right now, Amazon is stealing your customers. This is a way to fight back.